Pinch-hitting as Police Commissioner for his friend Kirkpatrick, Richard Wentworth found himself in the most difficult spot of his long career, when Munro — the Deathless One — came back to loot the city and destroy the Spider, at the very time when Wentworth’s enemies in the department had united to tie his hands! 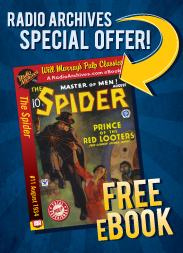 Meet the Spider—Master of Men! More just than the Law...more dangerous than the Underworld. Hated, wanted, feared by both! Alone and desperate, he wages a deadly, one-man war against the supercriminal whose long-planned crime-coup will snuff a thousand lives! Can the Spider prevent this slaughter of innocents? This was how the editors of the Spider magazine first introduced their avenging new hero, and this description fits our latest audiobook release perfectly. During the difficult decade encompassed by the years 1933-43, a commanding figure blazed his way through a legion of Depression-era supercriminals, Nazi spies and saboteurs. Though others fought injustice, none did it with the savage style of this hero. He was wealthy criminologist Richard Wentworth. He was also secretly the Spider! Nick Santa Maria reads this exciting suspense story of murder, mayhem and mystery that perfectly evokes 1941 Manhattan. The Spider and the Deathless One originally published in The Spider magazine, September, 1941.